In Misc. 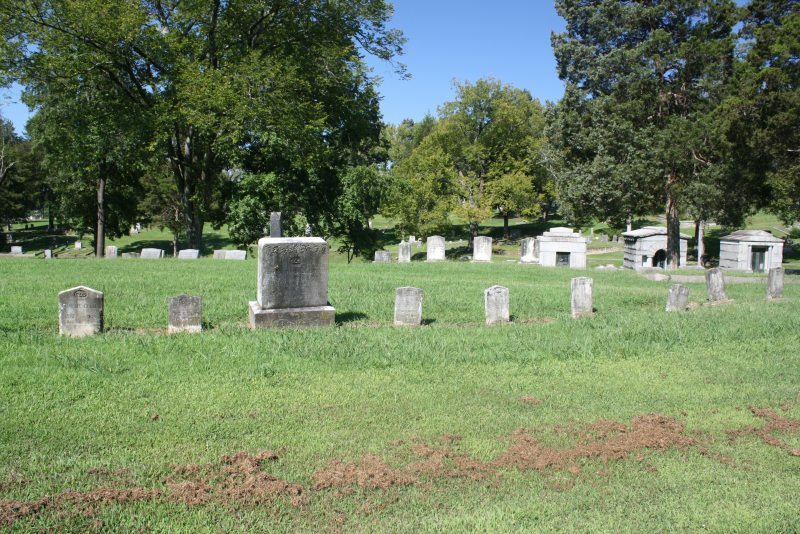 Mortuary Mysteries I mentioned Ira Tuck, 34, who died on August 31, 1889 with a cause of death: “Self Suicide.” I knew from the Mortuary Report that he was buried in the Odd Fellows Section of the cemetery and that his final arrangements were handled by the undertakers at T.A. Fox & Company. Months ago I learned that Ira was a bartender at the Diamond Saloon and Restaurant in 1881, but without a tombstone and additional information I put his story on hold. The day after I posted about those “mysteries” I went back to Green Hill, without any specific purpose. (If it’s nice outside and I don’t have other plans, I’m probably in a graveyard somewhere.) I’m not sure how I overlooked the Odd Fellows section before, but it was right on the main driveway. (D’oh!) Ira’s grave was among the mostly-uniformly styled tombstones donning the Independent Order of Odd Fellows’ emblem: three links of a chain which represent “Friendship, Love, and Truth.” Many Odd Fellows markers have an F, an, L, and a T in each of the links. I can’t tell if Ira’s tombstone has those initials or not. 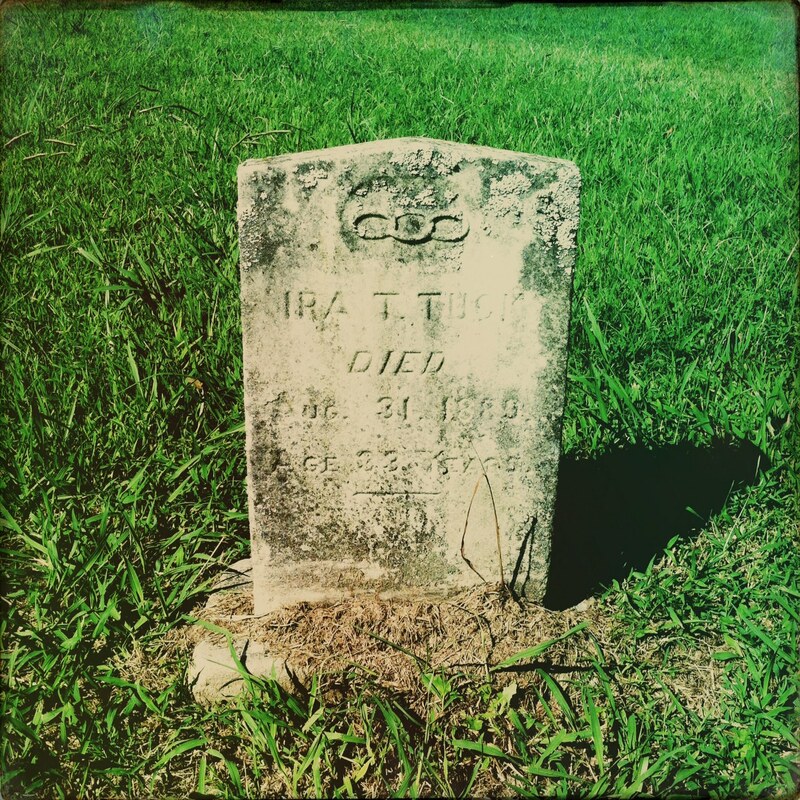 Ira T. Tuck was born “around 1856” (possibly 1855) in Halifax County, Virginia to Richard and Sarah Whitt Tuck. In January 1870 Ira’s mother died from “acute rheumatism” according to the Census Mortality Schedules. 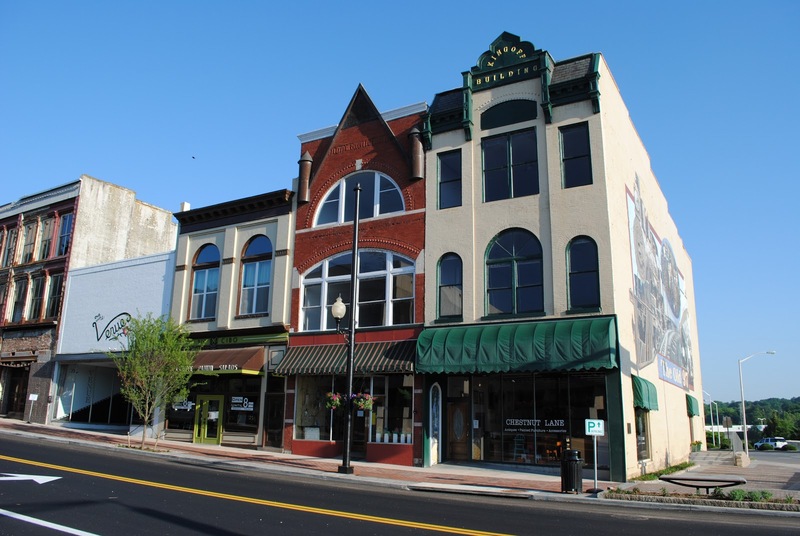 When the regular census was taken in June 1870, Richard’s occupation was listed as “farmer.” Also in the Hyco Township, Halifax County home were siblings Edwin (farmer, 21); Mariah/Maria (“house keeping,” 19); Sarah (“at home,” 16); Ira (“at home,” 14); and Robert H. (“attending school,” 12). During the next decade Ira migrated to Danville and found work as a bartender. 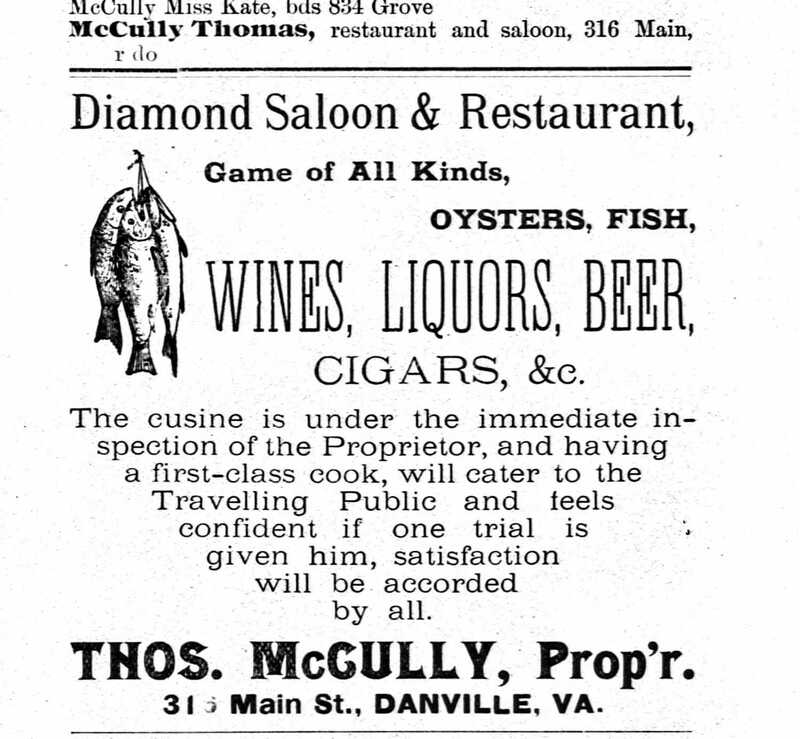 When the 1880 Census was taken he was a boarder living with “restaurateur” Thomas McCully, employed at the Diamond Saloon. This ad was printed in a directory after Ira’s death, but McCully’s business appears to have been at the same 316 Main Street location while Ira worked (and possibly lived) with McCully. 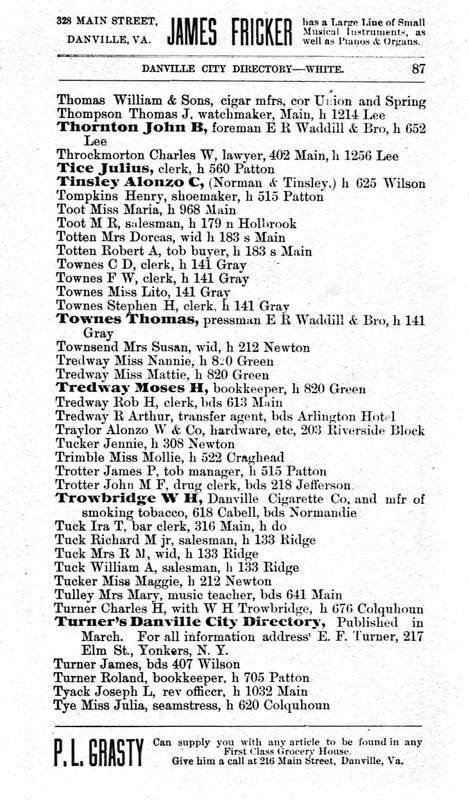 Pinpointing Ira’s home address was complicated by illegible handwriting on the 1880 census and directories which only listed the saloon’s location. It’s possible that the men had living quarters in the building over the restaurant, but without more evidence I can’t say that for sure. The last bits of information about Ira are those from the Mortuary Report and the Virginia Deaths and Burials Index. The only “new” data about Ira from the latter was that he was single when he committed suicide. I hoped to find something in the historical newspapers that would hint at why, where, or how Ira took his own life but those secrets (at least for now) are buried with him at Green Hill. *I apologize for the oddly-sized text. When I migrated to WordPress, my formatting became haunted. I will retype entries as needed. Next Next post: Dr. Reuben Knox: "Accidentally Drowned & Lost in the Bay"